"an added layer of protection"
Now you can stop mold growth durring new construction and protect your new home by applying Microshield�s 2 Step Anti-Microbial Mold Pretreatment to your home's completed structure prior to drywall. Microshield ES uses a 2 Step Mold Pretreatment System to Clean, Disinfect, and Protect the Home. Both steps are safe, approved, and non-corrosive. The 1st Mold Pretreatment Step Destroys Microorganisms upon contact, Safely Cleaning and Disinfecting the Home. Eliminating mold on trusses, lumber, and other building material. The 2nd Mold Pretreatment Step Encapsulates the Structure with a permeable anti-microbial that prevents airborne microorganisms from regenerating while providing the Builder and Homebuyer a complete Warranty and "Mold Free Building Material". 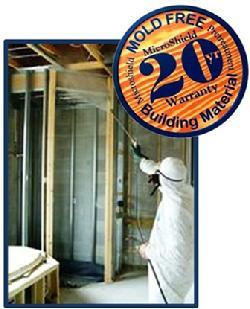 Microshield ES Mold Pretreatment can be used in New Construction, Water Damage Restoration, Mold Remediation, and Renovation. mold on trusses, lumber, and other building material. "Mold Free Building Material". The Microshield ES Mold Pretreatment coating is available for application to wood, paper, plastic, concrete and metal to safely eliminate mold on trusses, lumber, and other building material. "Mold Free Building Material". Microshield ES uses E.P.A. approved and registered mold pretreatment chemicals that offer the Home Builder and Homeowner superior protection against dangerous and destructive microorganisms, disease causing bacteria, fungi, and viruses that cause illness and threaten health and well being. Providing the builder with an answer to the burning question? What are you going to do about the mold on my trusses? "We will Microshield Them" and provide "Mold Free Building Material"
Microshield Environmental Services Mold Pretreatment is applied during the frame stage of new construction when the home is "inspection ready." We provide complete coverage of the homes interior, including masonry and wood frame exterior walls, metal and wood frame interior walls, trusses, doors, windows, plumbing and lumber. Safely eliminating mold on trusses, lumber, and other building material. 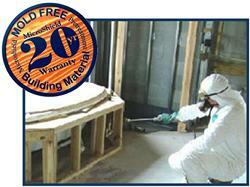 Microshield Mold Pretreatment "Mold Free Building Materials". Complete new construction coverage without option hasseles. Providing Superior Mold Protection and Mold Prevention for Homebuilders and Home Buyers. Microshield Mold Pretreatment "Mold Free Building Materials". Microshield ES protects all new construction treated surfaces against microbial growth backed by a 20 yr Warranty. Microshield Mold Pretreatment "Mold Free Building Materials". Providing Complete Mold Protection and Prevention for your next home. Microshield Mold Pretreatment "Mold Free Building Materials". Microshield ES specializes in the application of mold pretreatment anti-microbial disinfectant and encapsulants to new construction materials (i.e. mold on trusses and lumber) in residential and commercial buildings. Treatment of moldy building materials prior to drywall greatly reduces the potential for costly mold remediation and/or litigation should water intrusion or high relative humidity cause mold growth on new construction material such as trusses and lumber. Dealing with homeowner concerns about mold on trusses and lumber durring new construction has become a significant issue for builders as publicity increases consumer awareness and anxiety. The Pro-Active Builders are addressing these concerns prior to "close-in," that is, before sheetrock and finishing components are added durring construction. Today, a select number of builders are taking certain steps to minimize their mold liability risk. These builders are using new building envelope designs that improve interior moister control and are using building materials that don�t support mold growth. Additionally, these builders are using Microshield ES mold pretreatment "Mold Free Building Materials" on all vulnerable new construction materials that could support mold growth under the right conditions. The cost of new construction mold pretreatment far out weighs the risk associated with a future mold liability law suite and provides Home Buyers with a better quality home.